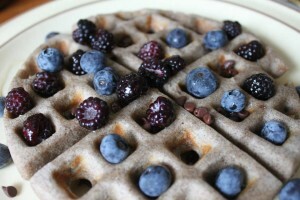 Buckwheat is superior to all grains, as well as soybeans, as a source of protein. It is the only natural, cholesterol-free source of all eight of the amino acids that the human body needs to consume. Many think that buckwheat is a grain. However, it does not grow like typical grassy grain plants (think wheat). It is more like a fruit, and in fact is related to the rhubarb plant. Buckwheat plants produce seeds which are eaten or ground into a dark, grainy-like flour. Traditionally, buckwheat pancake yeast mix had to raise overnight. But Stanton’s hearty, dark-grain pancakes are special, as they may have been the first mix created in the late 1800s (according to our lore) that was self-rising — to which you only had to add water. No yeast, buttermilk, eggs, or oil. 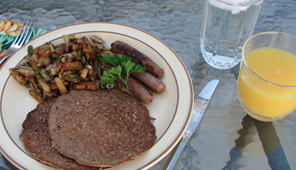 Our “Stanton’s Own Old-Fashioned Self-Rising Buckwheat Pancake Mix” is an all natural product with only eight ingredients: Light and Dark Buckwheat Flours, Wheat Flour, Powdered Milk, Corn Sugar, Phosphate, Soda, and Salt. It is packed with Protein, Fiber, and Complex Carbohydrates! Use Stanton’s Own as a protein-rich, low-fat, cholesterol-free replacement for other self-rising cooking mixes. Enjoy our delicious products, delivered right to your doorstep!